Last summer, we proudly announced that we were a certified Avalara partner, with seamless and transparent integration between InOrder ERP software and AvaTax. This integration simplifies the tax calculation process for InOrder users, easily calculating the final sales tax amount on every invoice. InOrder supports both AvaTax Basic and AvaTax Pro. Benefits of AvaTax Pro include access to tax research for over 2400 products & services, and 100,000 taxability rules, as well as ongoing tax research and maintenance. Another benefit with AvaTax Pro is that Avalara manages taxability for you, which is very helpful if you sell a variety of products and services, your tax rules vary between jurisdictions, or you have nexus in multiple locations. If you want the perfect solution for calculating and filing sales tax, contact us for more information about integrating InOrder with AvaTax. Entering timesheets is easy when you’re sitting at a desk. Simply open the timekeeping software and enter your time as you complete your tasks. But when personnel are moving around a warehouse all day, tracking time can get a little tricky. Every employee does not have his or her own computer station, and having employees log in and out of one station all day isn’t very efficient. 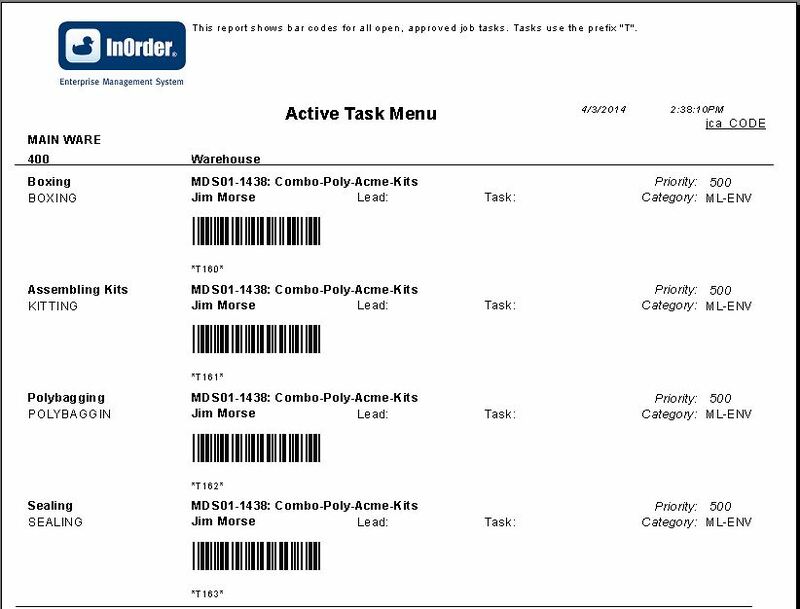 Using the Job Cost module of InOrder ERP, warehouse personnel simply scan their badges and the barcodes of the task they are working on from a daily Active Task Menu. InOrder keeps track of the time between each scan. Typically, a project manager or warehouse manager can also scan a task and then scan the badge of each person who will work on it. The project manager can also track who is still clocked in, and then press one button to end a shift completely. The InOrder Team is attending the IRCE in June. The IRCE is the world’s largest eCommerce event, and this year is its 10th anniversary. If you’re looking for a leading ERP system with a strong eCommerce platform, stop by our booth (#708) and ask what InOrder can do for you. If you are in Chicago for IRCE, and you are looking for a place to eat that is maybe not as flashy or sophisticated on the outside, but has the best food, here is a listing of places within a 30 minute drive of McCormick Place, as featured on the popular Food Network program “Diners Drive-Ins and Dives.” Of all cities featured, Chicago boasts the most appearances on the show. Use the links to research the episode and the establishment’s website. We recommend you always call ahead and add a few more minutes for traffic. Learn how to get the most out of InOrder. Join us in Orland Park, IL to learn how to make InOrder work better for you. We have classes for all user levels, from basic setup and introduction to advanced classes for more complex processes. Do you have new employees who need to learn InOrder? Have you recently had a major upgrade? Have you added modules or enhancements? We can help you get everyone up to speed to use InOrder to its fullest advantage. If you prefer, you can schedule a class at your office using your data. Call us for details at 800-860-9515.